The whole experience was a memorable way to spend time together as a family. The stories shared were just invaluable. It made me realize how difficult it is to open up to even those closest to us without some gentle prompt. I think we are often taught that talking about ourselves can be self-centered, being vulnerable can be a sign of weakness (especially for the males in our lives), and that emotionally connecting to each other by openly talking to each other will expose those vulnerabilities. Somewhere along the line, we stopped asking each other what I call “beautiful questions” - the questions that allow each of us to shine even around the darkest topics. We’ve managed to shut off one of the most wonderful aspects of our humanity – our ability to feel and sense and express to each other what it means to be alive, to be connected. 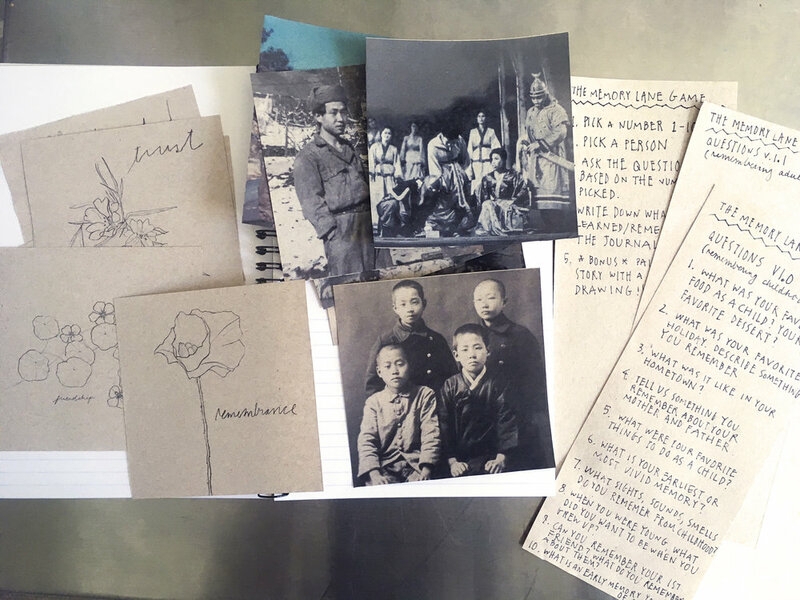 My mom’s story: My mother grew up in Korea before the war and remembers how her mother (my grandmother) was always protecting others in the community. 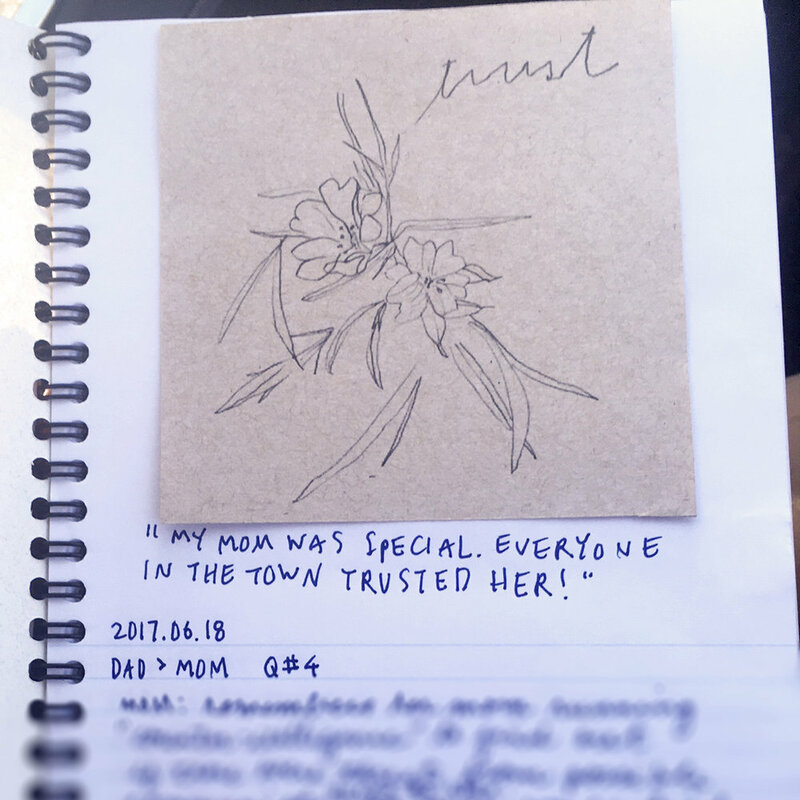 My mother picked up the ‘trust flower’ from the Gratitude Blooming drawings we had laying around and said with nostalgia: “My mom was special. Everyone in the town trusted her!" My dad’s story: When my dad was very young, he tried to get a drink of water from a shallow well near his family’s property and fell in. The well was ~1km away from his house but he managed to pull himself out and make his way home. We later drew a map of his family’s property – what he could remember of it – and I learned there was an outcropping they called Big Eagle Rock that was like a guide that marked the road leading home. We also drew a map of my mother’s hometown. What an unexpected, wonderful thing to experience together. Just as quickly as the stories were shared, they also faded into memories but I felt we kept something important alive that day. And, there is nothing stopping us from trying again – from learning and practicing how to ask each other beautiful questions, to share the stories that really matter to us, to have a chance to listen to each other again. For Father's Day this year, my Gratitude Blooming colleagues and I have tried to re-create this game so you can try it out yourself. See the Gratitude Blooming store for more information.